In a dingy office in Fisherman's Wharf, the glass panel in the door bears the names of A. Kimrean and Z. Kimrean. Private Eyes. Behind the door there is only one desk, one chair, one scrawny androgynous P.I. in a tank top and skimpy waistcoat. A.Z., as they are collectively known, are twin brother and sister. He's pure misanthropic logic, she's wild hedonistic creativity. The Kimreans have been locked in mortal battle since they were in utero...which is tricky because they, very literally, share one single body. That's right. One body, two pilots. The mystery and absurdity of how Kimrean functions, and how they subvert every plotline, twist, explosion, and gunshot—and confuse every cop, neckless thug, cartel boss, ninja, and femme fatale—in the book is pure Cantero magic. Someone is murdering the sons of the ruthless drug cartel boss known as the Lyon in the biggest baddest town in California—San Carnal. The notorious A.Z. 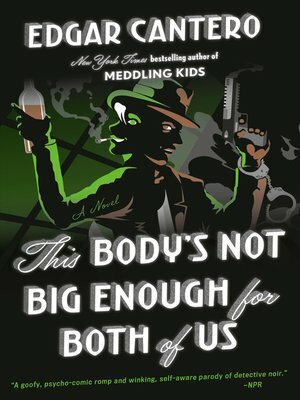 Kimrean must go to the sin-soaked, palm-tree-lined streets of San Carnal, infiltrate the Lyon's inner circle, and find out who is targeting his heirs, and while they are at it, rescue an undercover cop in too deep, deal with a plucky young stowaway, and stop a major gang war from engulfing California. They'll face every plot device and break every rule Elmore Leonard wrote before they can crack the case, if they don't kill each other (themselves) first.